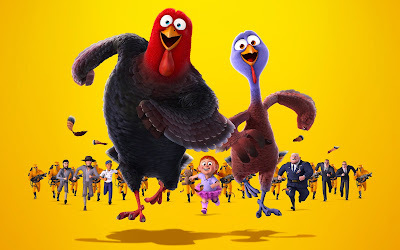 Stories Of A Happy Mom: Movie review: "Free Birds"
It has been sort of "slow" in the kid movie department since the summer ended, so we were destined to watch "Free Birds" since it's one of the few family friendly movies out right now! The movie is very slow and even a bit complicated for young children; the story gets lost in how complex it becomes and some of the characters fall flat. While the dialogues are pretty funny and the sarcastic references (intended for adults) did get a chuckle out of me, I don't think the movie is all that great! I think the story was repetitive and lacking innovation; it was also missing music and action... they could have made so much more with this concept...but oh well! I give this one 2.5 out of 5 stars... maybe wait for the DVD?